While I was away over the holiday break I picked up a few little inspirational items that I wanted to share with you. One of them was this book from kikki.K- Now Is the Time. As the blub says its "a beautiful book outlining 170 ways for you to seize the moment and make the most of your life now. Be inspired to live life to the fullest, feel relaxed and to go beyond the everyday, reminding you just how special and important these moments truly are." Sounds good right? Well I don't expect it's able to perform magic and transform me completely, but I am enjoying reading some of the quotes. Here's one today that I think is personally found quite challenging and is something I'm trying to do. Sounds easy and for most people it probably is. 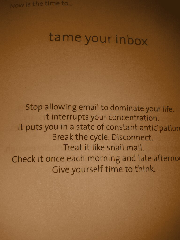 For someone who's job is dominated by a large flow of email everyday it's a challenge I have to overcome. I think the last line is enough of a reason to try and achieve it though - time to think. Something I can combine with my tea hobby perhaps. Time to turn off and tune out for a while. I'm off to give my brain space to be creative.